Some people might put the plantain into the same category as the arepa. It’s, arguably, bland, doesn’t have much taste, it’s boring. Gasp! But plantain is anything but plain, and Colombian abuelas have been using it in their cooking for ages. This over-sized banana is so versatile and has been used in so many dishes that I think it warrants a post. 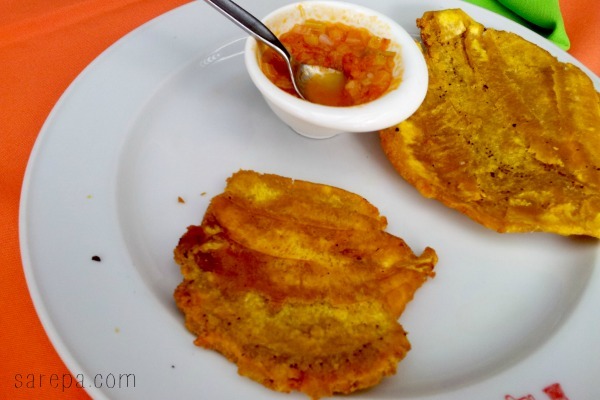 So, here is my ode to the plantain and its many shapes and forms in Colombian cooking. This is probably my most favourite way to eat plaintain. What you do is peel the plantain and cut it into 1 inch or so long pieces. Fry it in a pot of oil and remove from the pot and place the pieces on a plate covered in a paper towel, to remove the excess oil. Then squash your plantain pieces so their roughly in the shape of a circle. You can do this by placing the plantain under a piece of cloth and squashing it with the underside of a plate. Fry them again and then lather them in hogao. Yum. Plantain can also be found in some warm and comforting soups. Perfect for those chilly Bogotá nights. This is like the shortcut version of patacones. 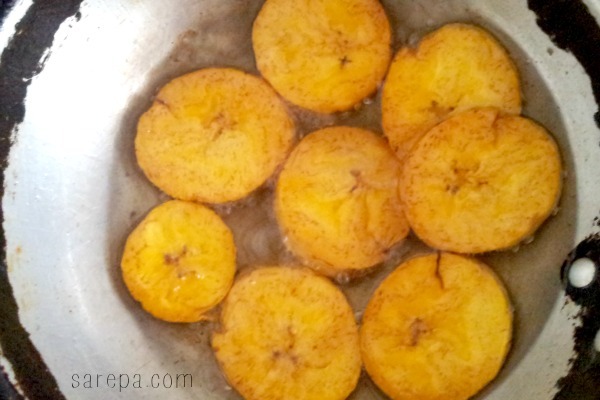 If you’re feeling lazy, just chop up your plantain into thin pieces and fry them up. Hogao, again, is a must. These babies are also sliced and sold on the side of the road. Fast Bogotá street food. As well as your green plantain there is also the more mature and sweet variety. These are softer and are a regular accompaniment to a lot of dishes here in Bogotá. Now these babies are probably the most decadent of plantain dishes. 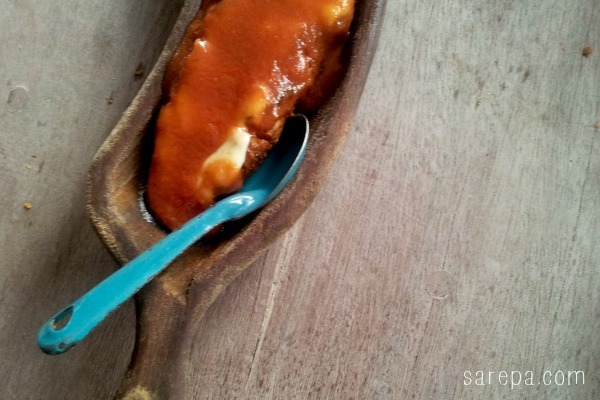 This is a fried piece of ripe plantain, stuffed with cheese and bocadillo, then fried. Oh. Yes. What’s your favourite way to have plantain? Let me know in the comments section below. Yum! These recipes look great! I shouldn’t have read this on an empty stomach. Patacones are my favorites! They go perfectly well with fríjoles and rice. Hungry now! Thanks vocabat! I’m making it my mission today to get a hold of patacones and hogao. So good!